Long-term success for app developers does not mean only getting someone to download their app, but also getting them to make repeat visits. To get to the must-have value proposition of your app product, you need to go beyond vanity metrics – like download counts and even daily active users (DAU) / monthly active users (MAU) – that only measure growth and retention superficially. You need to dig deeper into your app using a method –Cohort Analysis. Cohort analysis is a subset of behavioral analytics that takes the data from a given eCommerce platform, web application, or online game and rather than looking at all users as one unit, it breaks them into related groups for analysis. These related groups, or cohorts, usually share common characteristics or experiences within a defined time-span. Cohort analysis is a tool to measure user engagement over time. It helps to know whether user engagement is actually getting better over time or is only appearing to improve because of growth. Cohort analysis proves to be valuable because it helps to separate growth metrics from engagement metrics as growth can easily mask engagement problems. In reality, the lack of activity of the old users is being hidden by the impressive growth numbers of new users, which results in concealing the lack of engagement from a small number of people. 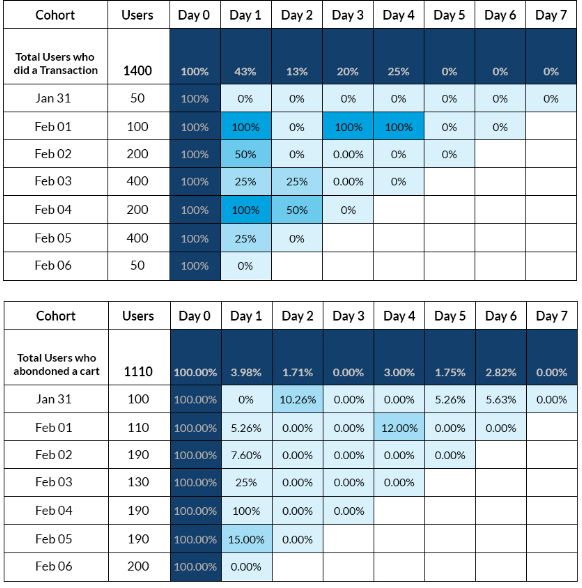 Let’s understand using cohort analysis with an example – daily cohort of users who have launched an app first time and revisited the app in the next 10 days. 1358 users launched an app on Jan 26. Day 1 retention was 31.1%, day 7 retention was 12.9%, and day 9 retention was 11.3%. So on the 7th day after using the app, 1 in 8 users who launched an app on Jan 26 were still active users on the app. 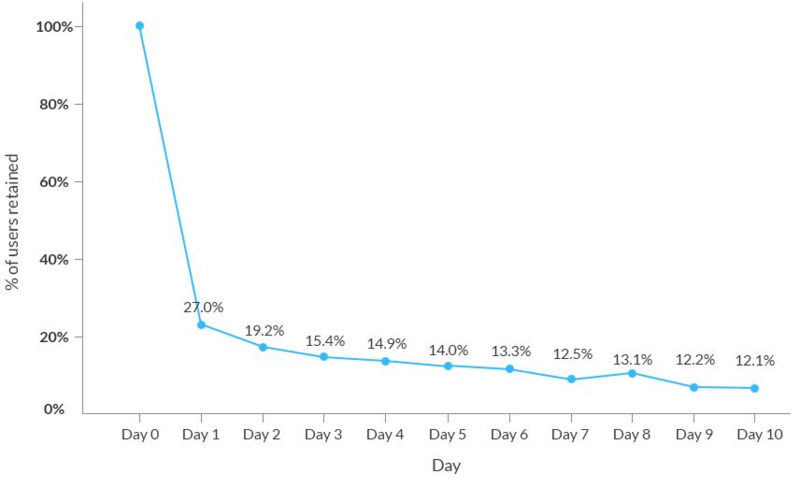 Out of all of the new users during this time range (13,487 users), 27% users are retained on day 1, 12.5% on day 7, and 12.1% on day 10.
user lifetime (as depicted horizontally to the right of the table) – seeing the long term relationship with people in any cohort – to ascertain how long people are coming back and how strong or how valuable that cohort is. This can be presumably linked to something like the quality of the product, operations, and customer support. Whatever the evaluation key metrics you define for the business, cohort analysis lets you view how the metrics develop over the customer lifetime as well as over the product lifetime. Cohort analysis involves looking at the groups of people, over time, and observing how their behavior changes. For instance, if we send out an email notification to 100 people, some may buy the product on day 1, less on day 2, even fewer on day 3, and so on. But, if we send another email to 100 people, after few weeks, they’ll be buying the product on their “day 0”while the first sent email might show its prevalent lag effect on the buying decision. In order to track how users behave over time or how the same behavior differs for different cohorts, cohort analysis helps to compare these people by the way / time they were acquired or by the retention of those users over time. Acquisition Cohorts: divide users by when they signed up first for your product. For your app users, you might break down your cohorts by the day, the week or the month they launched an app, and thereby track daily, weekly or monthly cohorts. In this case, by measuring the retention of these cohorts, you can determine how long people continue to use your app from their start point. Behavioral Cohorts: divide users by the behaviors they have (or haven’t) taken in your app within a given time period. These could be any number of discrete actions that a user can perform – App Install, App Launch, App Uninstall, Transaction or Charged, or any combination of these actions / events. In this case, a cohort can be a group of users who did certain actions within a specified timeframe – say, within first 3 days of app use. You can then monitor how long different cohorts stay active in your app after they perform certain actions. Let’s see how you can use both acquisition and behavioral cohorts to determine exactly what your users are doing and when they’re doing it. The above retention curve indicates that users are not getting quickly to the core value of the app, resulting in drop-offs. Hence, it’s evident to improve the onboarding experience to get the user to the core value as quickly as possible, thereby boosting the retention.